BD Army has recently published a hot job circular to recruit as SAINIK in Bangladesh Army. The recruitment will be begin on 22 July, 2018 and continued upto 31 December, 2018. 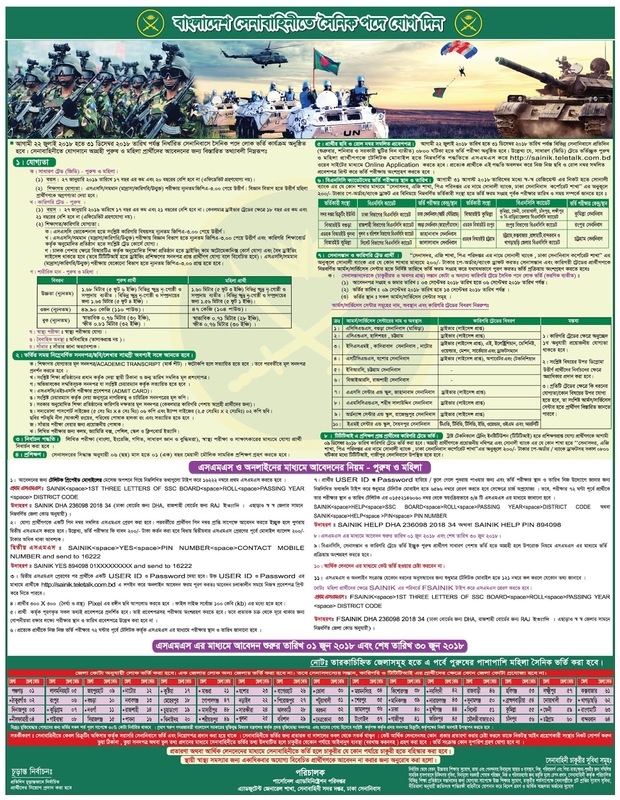 Army Sainik application last date on 30 June, 2018. General Trade: Age- 17 to 20 years on the date 27 January, 2018. Minimum SSC/ equivalent exam passed with minimum GPA 3.00 . Age- 17 to 21 years on the date 27 January, 2018. Minimum SSC/ equivalent exam passed with minimum GPA 3.00 and proof of yourself (like as certificate of driving license etc). Example: SAINIK DHA 236098 2018 34 and send to 16222. Example: SAINIK YES 894098 017XXXXXXXX and send to 16222. Then you will get User ID and password in return message. Then go to http://sainik.teletalk.com.bd and log in here to download admit card. Upload a 300x300 pixel photo of yourself before download admit card. Every applicant will know his examination location and time before 3 days. See details in the circular below.